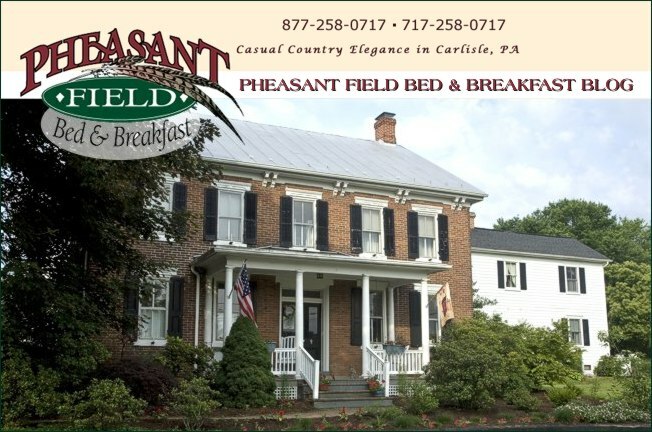 We love hosting equine guests at Pheasant Field B&B and have had opportunities to greet some equine "celebrities". Last night we had another special horsey guest. 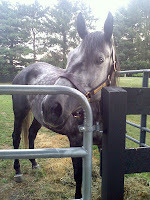 "Ondulee" (see picture) is the great, great, great, granddaughter of the one and only "Secretariat"! 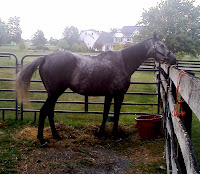 Ondulee was coming from her home at Sutton Place Farm in TN and going to upstate NY. Sutton Place is a well respected Thoroughbred breeding farm and has wonderful bloodlines in their herds. Maybe your horse doesn't have champion bloodlines but I'm sure it's a winner in your heart! Bring your equine companion when passing through our area. We will be happy to provide a comfortable layover for you and your horse too - whether it's a champion or just a wonderful pet.